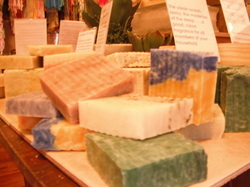 Handmade Natural Soaps, Made in the Carolinas! Gourmet: Vanilla, Oh Sugar!, Pure romance or something similar! Surprise me: it shall be a fun surprise assortment of great sellers! You will get three slices of soap shipped to your door (if your door is in the continental US) for $19! Fruity Floral Earthy Gourmet Surprise Me! Our Soap Rocks are the full 6 oz Soap Rock size, not the smaller 4 oz rockette that some sites sell! These glycerin based soaps are gentle enough for sensitive skin and boast a light fresh fragrance. Perfect for a present, to you for someone else! 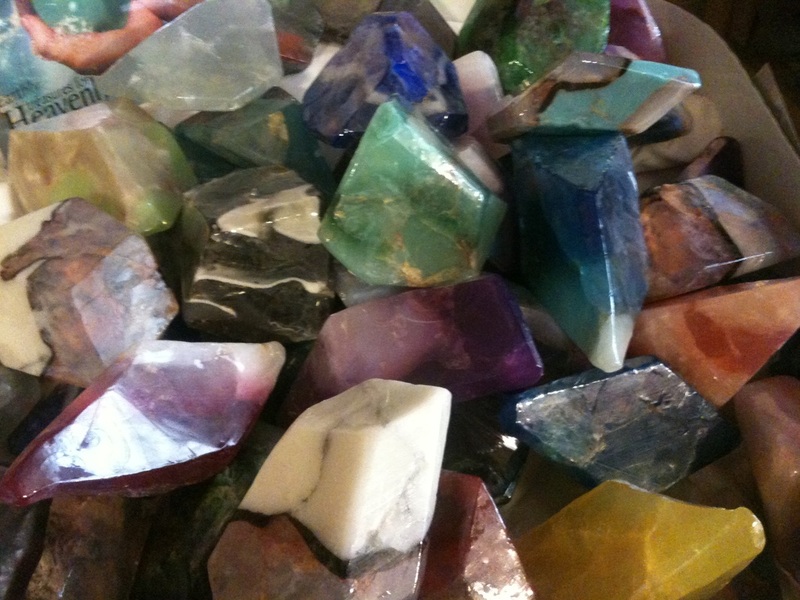 You pick a color family, we'll pick two gorgeous 6oz soap rocks to send you! Made in the USA! Sari scarves! Women in India sew these amazing scarves from recycled saris! No two are alike--that is part of the wonder! When I picked mine, I couldn't decide--I threw them all in a box, and randomly grabbed one. I love it! They are approximately 6.5 feet long and 9 inches wide with gorgeous overlapping pieces sewn together to make a real statement! These beauties have sold well across ages and style types! $24 shipped to your door in the continental US. South Carolina nightlights! Exclusive to Green Springs and MADE IN THE USA, these nightlights are a best seller! The photo displays three nightlights, from left to right: clear, orange and blue. Each is approximately 3.75 inches wide by 4.25 inches tall, not including the plug in base. $24 shipped to your door in the continental US. 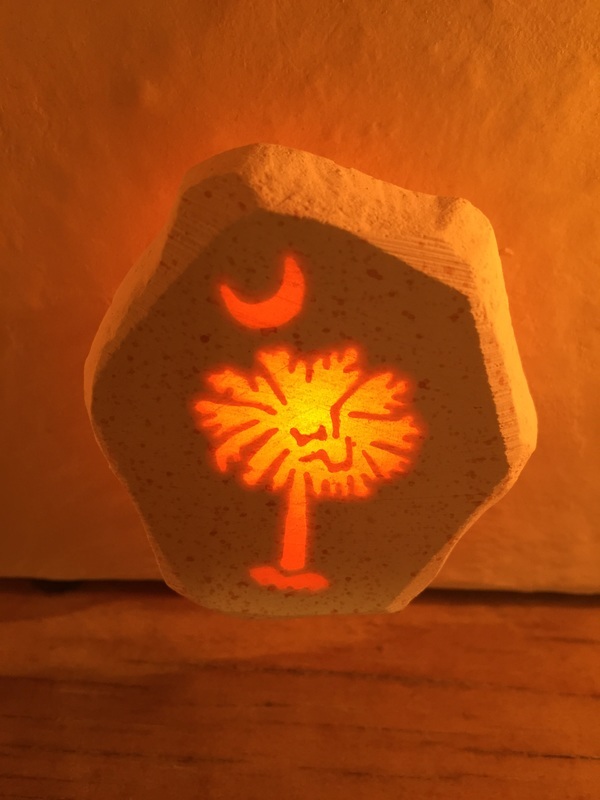 Exclusive to Green Springs and MADE IN THE USA, this mini nightlight features the symbol for South Carolina! It is approximately 2 inches wide by 2 inches tall. It comes with a LED bulb. Shipped to your door in the continental US for $16. For years customers have been requesting to buy certain items online. Here goes! Since many of our customers are tourists or seasonal, we want to be able to supply you with some of our most popular items online! We will be adding items as we can, so keep coming back to see what we've listed! Also, if you want something that's not listed, call or email alison@shopgreensprings.com--we can email you photos, dimensions, pricing and then ship it out to you! Never hesitate to email or phone with questions also! We happily provide photos and descriptions. Ready to purchase? We can take payment over the phone or via PayPal invoices--nice and secure! Anything you purchase online we will ship out within two business days and we will email you tracking information at that time. Tracking will be emailed to the email address associated with the PayPal account used and all PayPal purchases will be shipped to the PayPal confirmed address. We greatly appreciate your support & business! !